Preparing for marriage is vital! But my lands, many of the pre marriage counseling programs offered cost hundreds of dollars. While I could argue that you should spend as much as it takes to get counseling before marriage – the hard reality these days is that money is in short supply for many. 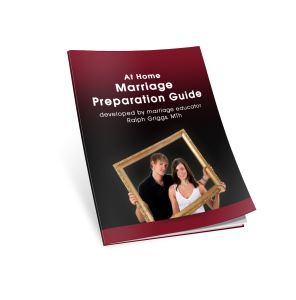 One of the exciting things for me is to be able to offer my At-Home Marriage Preparation Guide at a price that is affordable for anyone. 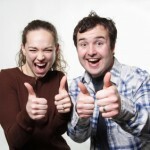 The marriage preparation guide that even the guys love! Yes, I’ve had more guys tell me that they enjoyed the course than even the women. And a frequent word used by both grooms and brides is that the guide was fun. My guide does not require a lot of reading and study. There’s a place for that. But the accidental genius of this guide is that it is simply a tool to get you talking to each other about your lives together . . . which creates a deeper level of intimacy. You feel closer than ever before! So, What’s in the Guide? Find a link to a free, brief personality test based on the famous Myers-Briggs Personality test. With a few clicks, find out how to show love and how to best communicate to your partner given their unique personality. Couples seem to enjoy this as much as anything in the guide. Personality tests can be expensive, but this one is quick and free. How easy and fun is this for marriage preparation? Rent this movie that’s used by many pre-marriage counselors. It’s several years old but the movie stars are well known. Watch it, and then talk about how this couple could have prevented things from getting so bad. There’s also a link to a website with a free study guide if you want to use it. It’s a fun and effective way to learn! I Feel Loved When . . .
Stop guessing what makes your partner feel loved. We tend to show love the way we experience it. This simple, brief exercise puts a stop to the guessing and allows you to tell each other exactly what makes you feel loved. Are you sure you know what your partner would list at the number one spot? Does your partner know yours? This is a simple and important exercise for finding out what your relationship strengths and growth areas are, and whether or not you both agree as to what they are. You can spend a couple of hundred dollars with a counselor using a scientific couples inventory to do this, or you can use the simple exercise in my guide to do it more informally. View all the topics in the guide, and the author’s page if you want to learn about me. And download a free sample exercise from the guide (1 page PDF) from the guide. *Couples getting married in Tennessee can save $60 on their marriage license with marriage prep. Find out how here. You can do the activities in this guide at your convenience. No scheduling meetings and driving across town. Do it as you have time. You don’t have to share intimate or embarrassing details with a stranger. This is all between the two of you – unless you decide later that personal attention would be helpful. You have the chance to build confidence in your decision to marry, you have fun while learning more about each other, and you become closer than ever before. 23 studies show that couples who do premarital preparation report a higher sense of partnership, make better adjustments to married life, and resolve problems better than those who do no premarital preparation – overall marital happiness is 30% greater. You can download this guide and get started right now! But before you do, let me mention a couple of freebies I’m throwing in. Because I believe your marriage will be enriched by using this guide, I’ve decided to add more incentive for you to get the course by giving you free these two additional guides..
Each of these guides sells for $7 separately, but they are yours free for getting the online marriage prep course. 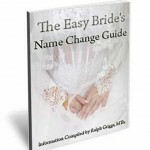 The EZ Bride’s Name Change Guide: Name change guides sell for $20 online, but you get mine free with the marriage guide. I developed this guide specifically for couples in my home state, but you will find that most of it applies to you, or at least gives you a heads up on what you need to do. 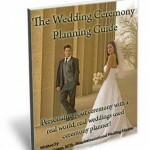 Wedding Ceremony Planning Guide: And, I had think for awhile if I wanted to give this away. 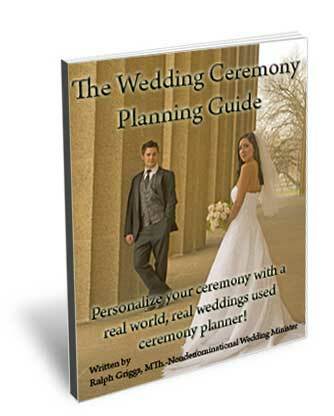 This is a ceremony planning tool that I first put together 10 years ago, and have used with hundreds of couples to personalize their ceremonies. At the end of each year, I edit and improve the planner. It is a real-world, real wedding tested ceremony planner. Most wedding ceremony books are too long, and most of what’s in them never gets used. And who has time to read them when planning a wedding? My planner is 10 pages long and includes what people like to use in their weddings. Couples have bought my Wedding Ceremony Planner just to get a copy of the “Hands Ceremony.” Most brides tear up just reading it (and some grooms). Often after weddings, guests will come up and ask for a copy of this part of the ceremony. My Wedding Ceremony Planner gets rave reviews from couples. I may decide to back this freebie out of the deal at some point and just sell it separately. 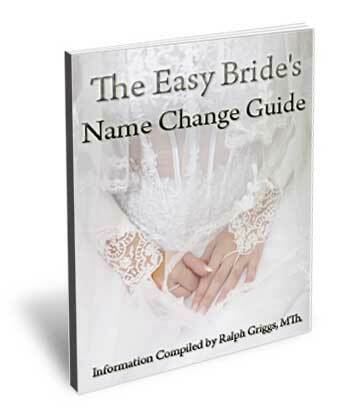 So to recap, with the marriage prep guide, name change guide, & ceremony planning guide, you get a value of at least $34. But it isn’t going to cost you $34. It’s only $20 for all three. I know that this a great deal. I know it, because I’ve researched other offerings online, and I know what local marriage seminars and therapists cost. I know it because I’ve heard and read positive feedback for nearly 10 years now from couples who’ve used my marriage prep guide. 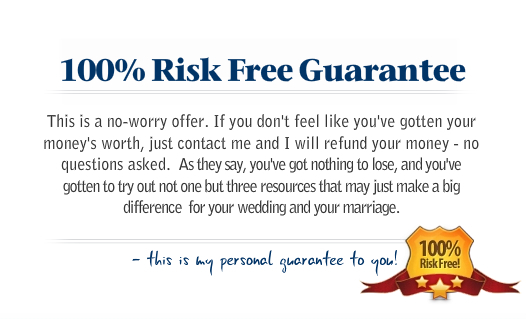 I’m going to guarantee your satisfaction, or your money back – no questions asked. My, I sound like a salesperson, and I’m really not. I just really do want couples to use this marriage prep guide, and that’s why I’ve made it so inexpensive, added the 2 free guides, and will take the risk myself by offering it with the guarantee. If you have any questions at anytime, contact me. Or maybe it’s not you – maybe it’s him, or her. Here are some of the common excuses I’ve heard and some thoughts to consider. “We already are getting premarital counseling.” Excellent! I’m glad you are. Not everyone is in a position to do that and you are fortunate. I encourage couples to do as much as they can in preparing for marriage, so I would suggest to you that you consider also using this at-home guide. You likely will find things in it you won’t get in your other marriage prep. And as I’ve told many couples, using my guide will help them more quickly pinpoint challenges so if they go for face to face marriage preparation, they can focus in on the key areas of concern. Your counselor will likely appreciate that, and it may reduce the number of times you need to go. “We talk about everything already.” That’s great, but I can’t tell you how many times couples have sat at my kitchen table and told me that while they believed they were great communicators that simply through the methodical process of going through the guide they, stumbled onto things they had not discussed. And other times, it simply provided an opportunity to go back to some things they had not discussed in a long time. “We are too busy.” Yes, I know. For couples getting married, on top of planning a wedding, they are often finishing school, starting new jobs, and building a house. This is exactly the reason I put this guide together. It became increasingly difficult to schedule face to face premarital counseling with couples. Sadly, it’s hard to get 3 people together with our busy lives! Much of what is in the guide is what I’ve done with couples in person over the years – but now without having to schedule meetings. You can find the time. It’s like the couple comment earlier who said the guide was a chance to stop from the rush of wedding planning and remember why they were doing it all to begin with. “We don’t really need it.” Well, it’s true that some couples need more preparation than others. But allow me to suggest some good reasons for doing as much marriage preparation as you can. Build confidence in your relationship strengths & explore new areas. A bunch of couples have told me that doing premarital preparation made them feel even more confident about their decision to marry. Get a heads-up on tricky relationship issues, and have some compromises worked out already. Begin marriage with the knowledge that your mate cares enough about the relationship to put some effort into making it grow. Have fun. Really, I’m not jerking your chain here. 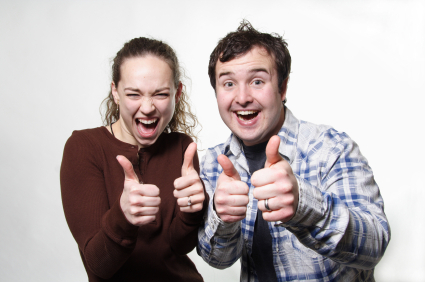 When done right, premarital preparation is fun. I hear it all the time. I really would like to see you try my guide. That’s why I’ve worked to make the cost affordable for most everyone, and added the Bride’s Name Change Guide and Wedding Ceremony Planner for free. Finally, I’ve decided to make this a money back guarantee. If you don’t feel like you got your money’s worth, just let me know and I will send you your money back with no questions. 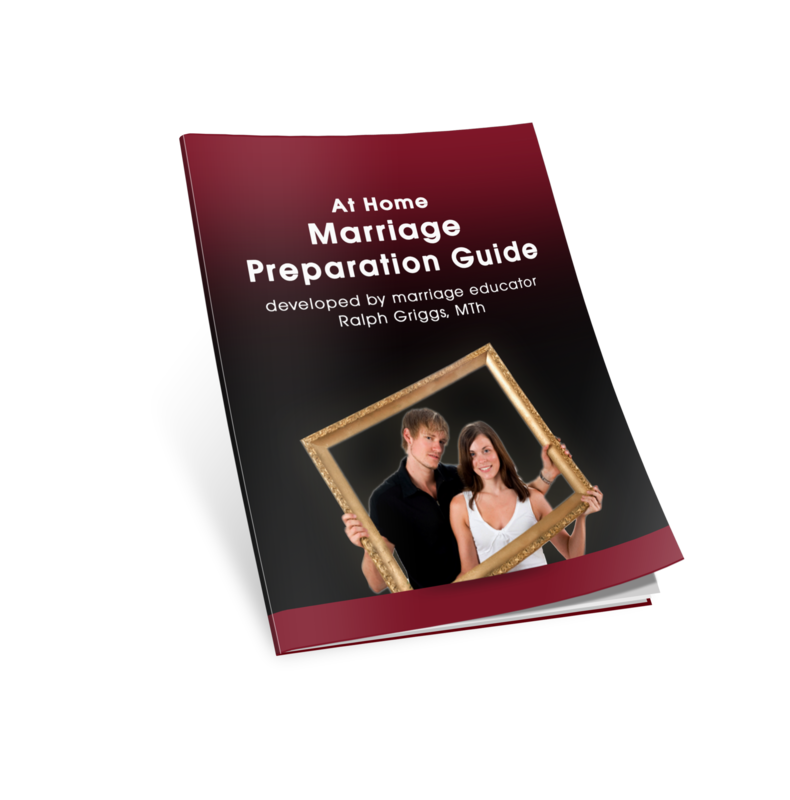 Download the At-Home Marriage Preparation Guide & free bonuses securely. You do not have to have a Paypal account to pay with your credit card of choice. In case you missed it, couples marrying in Tenn. can get a $60 discount on the cost of their marriage license by using my At Home Marriage Prep Guide. Click here for the details. Disclaimer: This is where the obvious is stated & some other things I want to make sure you know. The marriage preparation guide sold at www.marriagepreparationonline.com is not designed to serve as a predictor of your marital success. If you use the guide, it is not a guarantee that your marriage will be successful. I am not a licensed therapist and don’t present myself as such. If you have great difficulty working through the guide on your own, it’s a good sign that you should seek out professional help. Go to a therapist or see a local minister. The material in this guide is based on my work with couples over the years as a nondenominational minister, as well as my Masters & Doctoral level course work in counseling. With this guide, like most things, you’ll get out of it what you put into it. Maybe you just tied the knot, or are thinking of taking the plunge into the wonderful world of marriage. Or maybe you are a veteran with plenty more lessons learned than where these came from. Either way, here are a few words of advice for any couple no matter what phase of life they are in. 1. Pick Your Battles, Wisely.